The fight against the Competition Commission’s decision goes on, although since much of that continues to go on in darkened boardrooms and we occasionally get whispers of the latest developments, it’s hard not to feel a little disenfranchised at the moment. So with my own involvement in the campaign reaching a temporary lull, partly because of allowing the likes of Cineworld to pursue their own appeals and partly because, to paraphrase Derek Zoolander, I’m really really ridiculously busy right now with things that don’t relate to the inside of a cinema, I felt it was an ideal opportunity to dig deeper into one of the aspects of the debate that’s bothered me most. When coming to the conclusion that the Cineworld and Picturehouse cinemas were in direct competition, one of the pieces of supporting evidence revolved around the fact, supported by evidence from some of the cinemas, that the divide between art house and multiplex cinemas is breaking down and that digital projection allows cinemas to program a wider variety of films. Here’s some relevant paragraphs from the Commission’s final report on the issue. Distributors are responsible for the marketing of the films they handle. Their aim is to maximize a film’s profitability through promotional activity, the timing of the film’s theatrical release and the subsequent exploitation of DVD and television rights. Although the number of film releases has increased rapidly in recent years, the majority of new films do not achieve widespread release. Films are generally classified as mainstream or specialized (or non-mainstream), the latter category including foreign language and subtitled films, feature documentaries, art-house productions and films aimed at niche audiences. The BFI told us that the definition of specialized films included both films which were obviously specialized but also a range of films which were not inaccessible or challenging but which appealed to a specific demographic. Specialized films generally account for about 8 per cent of box office revenue. Cinema exhibitors told us that digital technology had delivered a number of benefits: it had given a high-quality experience to customers, enabled the growth of 3D, and made it easier to change programming and advertise with shorter lead times. Odeon commented that the full benefits of this had yet to be realized, as there was potential to programme even more flexibly… In particular, Odeon anticipated that digital distribution would reduce the requirement for a fixed number of shows per week (historically a minimum of 21) and might result in any digital cinema being able to programme more varied content each week. That gives some general background on how the industry currently sees itself. Now, something a little more specific from the cinemas, and the only paragraph I can find in the report that shows the cinemas are in competition in terms of programming, above and beyond a revenue comparison. Non-multiplex cinemas are typically located in town centres. Some of the non-multiplex cinema chains and independent cinemas focus more on showing specialized films. Some of these cinemas show exclusively specialized films (and are typically referred to as ‘art-house’ cinemas), but the majority show a mix of mainstream and specialized films. Vue told us that in its opinion there were only a very small number of cinemas that played only specialized films, for example the Cornerhouse in Manchester, the Watershed in Bristol and the Showroom Cinema in Sheffield. Odeon said that there was no longer a differentiation in the eyes of the industry between ‘Hollywood films’ and ‘art-house’ films and that the distinction between different types of cinemas had been eroded by more complex fragmentation, with cinema exhibitors trying to meet commercial targets by programming the most successful films for each cinema on a week-by-week basis. A number of parties told us that they expected to see more overlap in future between film programming in multiplex and non-multiplex cinemas as digitization allowed all cinemas to be more flexible in their film programming. So the view of the industry appears to be that the barriers are falling down. This must mean that access to the specialized films is becoming ever easier for customers, right? Although given that they only make up 8 percent of the market, maybe they’re not commercially appealing enough. What it doesn’t indicate is whether price or choice is viewed as more important. There is one paragraph that does comment on this, however. Similarly to the parties, Everyman told us that Picturehouse offered a different experience, product and programming mix to Cineworld. However, Everyman also stated that it competed with both Cineworld and Picturehouse in that they operated in the same industry but did not currently operate sites in locations where they competed directly against one another. Everyman believed that if it were to compete with Cineworld and Picturehouse it would be on a mixture of product offering and quality of service and that price would not play a major factor. We also received a considerable number of letters from the general public stressing the differences between the product offerings of the Picturehouse cinemas and the Cineworld cinemas in Cambridge and Bury St Edmunds. A smaller number of letters commented on competition between cinemas in Aberdeen. So at least one independent cinema chain, and the customers of the cinemas themselves, appear to contradict the views of the rest of the industry that these lines are blurring. But don’t worry, the rest of the industry was keen to contradict its own customers one more time. By contrast, Vue and Odeon did not draw such clear distinctions between the positioning of multiplexes and independent cinemas. Odeon told us that it was constantly evolving its cinema offer and attempting to ensure that each cinema catered for the widest demographic and taste and gave examples of refurbishments and upgrades it had carried out to meet specific needs. Vue stated that ‘a cinema is a cinema’. These views were echoed by Curzon: it believed that there was a large overlap between cinema types, with 60 per cent of customers willing to go both to multiplexes and independent cinemas. There is clearly a marked divide between how much of the industry perceives itself, and the opportunities that digital distribution can provide, and how the customers in the affected areas see this. But are Aberdeen, Bury St Edmunds and Cambridge unique cases, or symptomatic of a greater national divide? There is only one way to find out, and that’s to look at what cinemas across the country are currently showing. To do that, I’ve taken a snapshot of the fifty largest urban areas in England and Wales. I will admit up front that I’ve taken a slightly different approach to the Competition Commission; they effectively stuck a pin in the centre of an area and drew a twenty minute circle around it to consider how far people would travel. I’ve considered urban areas, simply on the basis that it’s easier for me to work out, but also on the presumption that public transport would allow access for anyone within that urban area to see the films listed. The full list of areas can be found here, and Cambridge – our test case in terms of the Commission debate – is the 45th largest urban area on the list. I’ve then looked at the films showing this week, between Friday 29th November and Thursday 5th December, in any cinema in each of those 50 urban areas. I’ve narrowed the field slightly; I’ve looked at those films given some form of general release in the calendar month of November, so either in this week or the four preceding weeks. I’ve taken my list from the films listed at Launching Films. (Cinema listing times have been taken from Google’s cinema listings pages.) There are a handful of mainstream films, including Thor: The Dark World, Jackass Presents Bad Grandpa and Captain Phillips that were released prior to this date that are still showing in the majority of areas. A number of cinema chains have had advanced previews this weekend, including screenings of Frozen in a number of cinemas. As well as that, the Picturehouse chain had advanced screenings of Nebraska on Sunday, Cineworld had The Secret Life Of Walter Mitty on Monday and Showcase had previews of Additionally, I’ve ruled out live events and Bollywood films for now to make the count easier – I’m hoping to automate the counting process with some of my IT knowledge from my day job, so that in future I can cover those too. So of those films released in November, there are a total of 30 still showing somewhere in one of those 50 urban areas this week. I believe they break down into three distinct categories: the mainstream films, which are showing exclusively at the multiplex type cinema (or their smaller cousins); there are the specialized films, which are showing pretty exclusively at the Picturehouse or independent cinemas; and then there’s the crossover films, those films likely to be showing in almost any cinema that has the capacity. This last list is the shortest, and they can be easily categorised at this time of year by the approach of awards season. If you had to go through the list of thirty and pick out the four most likely to be on awards ballots come January next year, it would be these four. Consequently, they have a broad, cross-demographic appeal that neither of the other lists can claim. Here’s the list of films, and the number indicates how many of those urban areas are still showing the films in question. So if you want to see time travelling turkeys or futuristic child slaying, you’re in luck as those are the two films guaranteed to be showing everywhere this week. If you live in Barnsley, you may have to make do with those, as it’s the one area not showing Carrie and no longer showing Gravity. You also can’t see Saving Mr Banks there, and if you live in Slough you’ll also have to travel. So this shows that there are effectively eight films fighting for the largest share of the box office, showing in more than two-thirds of areas, and whether or not you can see the other films is a form of cinematic postcode lottery. In terms of the overlap between cinemas, only one film provides any evidence: Joe Swanberg’s Drinking Buddies, a film from a small but prolific American director with a more mainstream cast, had one-off showings in thirteen Vue cinemas on Tuesday night. It certainly shows the potential of digital alluded to in the report, but it’s hardly being exploited to the full benefit of customers yet. But it’s not one that relates to the size of the area that you live in. Of the thirty films, I couldn’t find five of them showing in London this week, but there were still screenings at other cinemas around the country. But this is how the urban areas break down in terms of the proportion of those 30 films you can see this week in your area. While the larger areas have congregated towards the top, there are a few anomalies. The people of the larger areas of Birkenhead and Luton would likely be looking at a long journey to catch most of the films listed, although in Luton’s case there are a high proportion of Bollywood titles on offer as well; Birkenhead residents are faced with a trek to at least Liverpool to catch a wider variety of films. At the other end of the spectrum, Ipswich performs very well thanks to a community based cinema, and both Oxford and Cambridge perform especially well. Cambridge manages to come out joint second, despite having only three cinemas, and actually has performed consistently well; if you look at the list of specialised films in the first table, every one of those films has shown in Cambridge during November. A total of 24 of those 30 films have shown in Cambridge at some point in the past three months, a figure which makes me very glad to live where I do. You can then add in special, one-off screenings of classic releases or themed events, which would put another four onto the Cambridge total this week alone; the areas with cinemas engaged in such activities are almost all in the first column of that second table. So the diversity of films available in Cambridge is significant, and is the rival or the superior of any city outside London. But when the Office Of Fair Trading and the Competition Commission are fighting for the interests of customers over price, who is protecting the interests of customers over choice? Not the Department Of Culture, Media And Sport, who seem to have no interest in this debate (and a number of us have written to them, and received dismissive replies). But what are customers truly seeking? 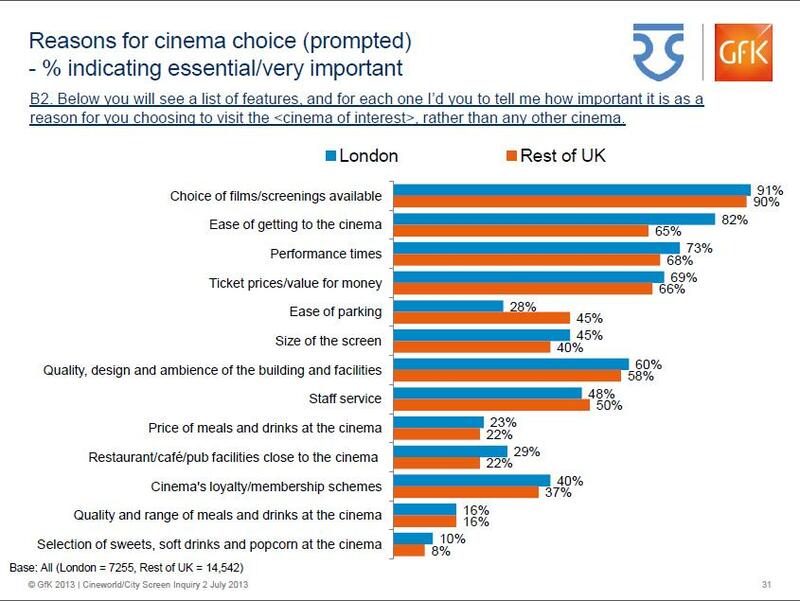 What’s most important to cinema customers in terms of what their local cinema offers them? If only we had some form of survey to answer that question, such as the independent survey undertaken by GfK for the Competition Commission as part of their investigation. This is slide 31 from their full presentation, available here. It shows that, of the 21,000 people surveyed, the choice of film is the single biggest driver to their reasoning. It would have been fascinating to see if that survey had given people the choice of one or the other, price or choice, to see which is the single biggest factor. So the residents of the Cambridge area remain worried that their privileged position of cinematic choice is being put in jeopardy in an effort to protect them from a potential price rise. But my survey also shows that the ideas of the cinema chains such as Vue, Odeon and Curzon that the barriers of the marketplace are breaking down are nowhere near coming to fruition. Only two multiplexes, one in Cardiff and one in London, are showing Blue Is The Warmest Colour this week, a film only released a week ago and winner of the Palm D’Or at Cannes this year. Almost everything else on the specialised list is studiously being avoided by the big cinemas outside of London, and while the likes of Odeon and Curzon are diversifying heavily in their London outlets, that pattern is the complete opposite of the rest of the country. There is still a clear divide in terms of cinema exhibition, with Picturehouse, Curzon’s London cinemas and a selection of independents (Manchester Cornerhouse, Leeds Hyde Park Picturehouse, Watershed Bristol, Showroom Sheffield, Newcasatle Tyueside, Broadway Nottingham and a few others) on one side showing a wide mix of crossover and specialised films, and the remainder (Cineworld, Odeon, Vue, Showcase, Reel, Empire and Everyman, plus smaller independent cinemas not in large urban areas) showing a mix of crossover and mainstream films. The only stipulation from the Commission is that cinemas have to be sold as a going concern, so any sale of the Picturehouses in Cambridge, Bury St Edmunds and Aberdeen could be to a cinema operator in the second list, not showing specialized films or at a drastically reduced rate, and at present no-one is fighting that corner on behalf of the customers who rate that more important than the price concerns raised by the OFT and the Competition Commission. This survey isn’t intended as a critique of any one particular cinema or chain of cinemas, but a call to all of them to be doing the most they can for their customers. I intend to run this survey on a regular basis, hopefully at least monthly, in an effort to understand if there is any movement in the right direction, and that movement needs to be on a national basis, not just in one area. In a world where these specialized films make up just 8% of revenue already, does that seem commercially appealing to new operators of cinemas when the regulatory bodies are prioritising competition over choice? So who is going to fight for choice in our cinemas, not just in Cambridge or the other affected areas but across the country? The BFI? (Here’s a copy of their letter to the Competition Commission on 30th August, expressing just these concerns, but which didn’t carry the same weight as the cinema operators in the final analysis.) Maybe it should be other local independent film trusts and film clubs? Maybe it’s the customers of the cinemas, who surely should have the most influence over the operators if they put their mind to it? Or does the answer simply start with you? This entry was posted in Obsession and tagged 2013, cinema, Cineworld, Competition Commission, distribution, film, movies, Picturehouse, State Of The Nation.